The affable and funny Steve Carell returned for his third hosting turn, and the endearing Ella Mai made her debut with a musically impressive, if somewhat forgettable, pair of performances. Here's everything that happened on Saturday Night Live this week. Kate McKinnon reprised her recently created impression of Fox News horror show Laura Ingraham and, once again, spoke with Cecily Strong's Judge Jeanine Piro, this week about voter fraud. Up next, Alex Moffat's robot Mark Zuckerberg, which is an amazing invention, was interviewed about Facebook's data breaches. Leslie Jones played Democratic representative Marcia Fudge, who wishes to unseat Nancy Pelosi as speaker of the house, but ends up setting off Fox News' "the country is changing" alert. The parade of disconnected guests finally landed on Pete Davidson playing the "Vape God" who Ingraham actually did interview recently, but by then this busy cold open had played itself out. 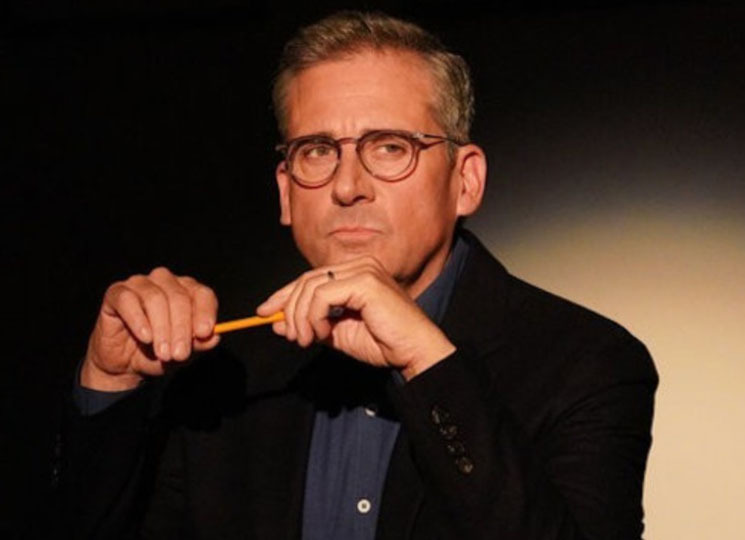 Steve Carell took questions from the audience, all of which were about whether or not he would consider doing a reboot of his old NBC sitcom, The Office. Beyond Kenan Thompson, the questions were all posed by former cast mates like Ellie Kemper, Ed Helms and Jenna Fischer, plus Carell's wife, comedic actress and former SNL cast member Nancy Carell and their kids, which was fun and culminated in a pseudo-announcement by Carell. Carell played a dad who wakes up his four kids to surprise them with a sudden trip to Disneyworld, only to discover he knows nothing about their or even his own life. Seemingly suffering from a brain injury that makes him oblivious to plainly visible facts and forgetful of recent, traumatic events, this dad was sad and this premise and its execution was funny. In this remote faux commercial, Carell played Jeff Bezos promoting Amazon. Rather than simply discussing the company, his Bezos sarcastically suggested that not every big move he and his company have made recently had anything to do with him seeking revenge against Donald Trump for his attacks against the company. In the end, this was a ruthless and topical sick burn. A few neighbours gather for Thanksgiving but a couple of strangers unsettle some old friends. Carell and Cecily Strong play a pair of less-familiar guests who suggest they vaguely remember a hit song about Thanksgiving, which doesn't seem legit to the rest of the close-knit party. But it turns out they all remember the "German" song and are so cast under its spell they don't notice something nefarious go down, which gave this funny idea a seriously great twist. Now frequently SNL's go-to hip-hop duo, Chris Redd and Pete Davidson paired up again to celebrate Supreme Court Justice Ruth Bader Ginsburg. Played by Kate McKinnon, Ginsburg was presented as some kind of superhuman liberal and the raps had a few good jokes that were bolstered by many decent visual gags. Man, this was good. Carell played a NASA astronaut beaming an educational video back to students on Earth from an international space station. Unfortunately his crew members, played by Mikey Day and Leslie Jones, caused some kind of terrible accident with a faulty hatch, and the station's animals and at least one cosmonaut perish as a result. With some neat camera work and props, this was uproariously funny. Ella Mai's wondrous voice was almost overshadowed by her busy drummer. So many sick fills back there. This likely wouldn't have been such a big deal if the songs she sung had more substance, rather than coming across as a warm-up exercise for musical virtuosos. This was true of both "Boo'd Up" and "Trip." Just kind of showcases for music store talent that were technically impressive, but lacked any real heart or emotional heft. Michael Che and Colin Jost made a bunch of jokes about Amazon moving to Queens, and Che went on an astounding rant about faulty voting machines. Mikey Day played Congressman Denver Riggleman, who appeared to defend himself against accusations that he is an aficionado of Bigfoot erotica. Day was amazing here, reading from a ridiculous book Riggleman wrote about such a thing and growing more and aroused with each passage. Kenan Thompson returned as boastful blowhard Lavar Ball to comment on the slow start of the Los Angeles Lakers, for whom his son Lonzo plays, which was marginally amusing. With Thompson likely concluding his record-setting run as a cast member this season, expect to see all of his most beloved recurring characters show up in the coming months. Heidi Gardner played a disheartened high school student at a sleepover sadly pondering her future prospects when she has a vision of Carell as a singer with a motivational message. Trouble is, her friend, played by Aidy Bryant, also sees him, and it's her missing and deadbeat dad. The awkwardly pointed interplay between Carell and Bryant was funny and the former really dialled up his exasperation to great effect. A couple of siblings, played by Mikey Day and Aidy Bryant, visit their parents who've relocated from their home into an RV. Carell played the headstrong husband and father here, but the star of this predictable premise was definitely Heidi Gardner, who's forced "I love it" made her sound more like a hostage than a willing partner in this hellish existence. Like the RV, this silly thing had no discernible ending and like the NASA bit, it was set in outer space. Carell played a Captain Kirk-esque space crew leader meeting with an alien congregation for a diplomatic meal. But something seems off about these aliens and it turns out there really is. Beginning with a prop mishap that made the cast laugh, and with further technical difficulties, this was a strange mess and proved to be rather pointless. Perhaps left over from sketch ideas stored in a folder stamped "2010," a couple on a long trip jazz up their GPS by switching its voice setting to "drag queen." Carell and Heidi Gardner played the couple in this remotely shot ad, who suddenly enter a RuPaul's Drag Race universe, with such iconography and terminology blasting into their car. An okay idea, even the show acknowledged its dated premise by saying the GPS was only available at a now-declining American electronics chain.